If you are trying to lose or maintain your weight, breakfast is the meal that is going to kick start your metabolism. If you don’t eat something in the morning, you are wasting valuable time where you are not burning calories. Calories in versus calories out is the mantra. So if you don’t eat in the morning, your metabolism doesn’t start to burn calories, and now you are behind all day long. Starting your morning with a breakfast that contains some protein allows your body and it’s blood sugar to be more balanced all day long. Try it out for yourself. If you eat protein at every meal and every snack, you will NOT have that dip in energy in the afternoon. If you have too many carbohyrdrates in the morning and it is not balanced with protein, no matter what you eat the rest of the day, your energy will not be as even and you will experience dips throughout the day. Experiment with it and see what makes you feel good all day long. Is it eggs and toast? Oatmeal with nuts? Chicken Soup? Every person is different. See what makes you feel the best. If you like something hot to eat in the winter time, then try out this yummy breakfast! *This is another delicious recipe based on one in “Feeding the Whole Family” by Cynthia Lair. This was my go to cook book for a long time. 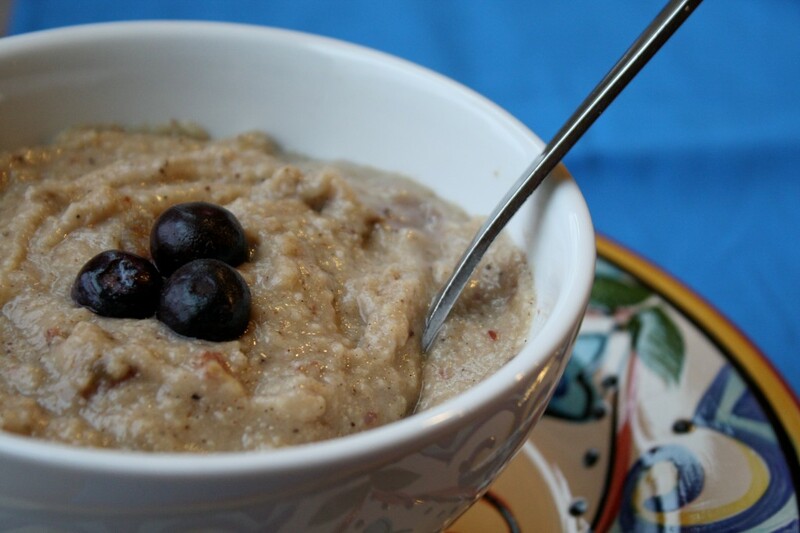 The cereal is like a cream of wheat, but more nutritious and packed with protein. You may use any grain that you like in place of the oat groats, millet and amaranth. I just like this combination because it offers some natural sweetness to the cereal. Oat groats do not contain gluten so if you are gluten free, then this combination will work for you. Lightly toast all of the above ingredients in an un-greased skillet. Toast only until a distinct nutty aroma is apparent. Grind all ingredients in a coffee grinder or blender, until fine. Cook 1/3 cup of the ground cereal with one-cup milk, milk alternative or water in a small pan over medium heat. Cook until thick. Stir frequently to avoid burning. Store the rest of the ground cereal in the refrigerator or freezer.